Shopping for Big Bang Theory Action Figures? Bif Bang Pow! 3 3/4-inch action figures based on The Big Bang Theory! One loquacious geek, coming right up! Howard Wolowitz from The Big Bang Theory is here! When it comes to loquacious geeks, aerospace engineer Howard Wolowitz is your man. 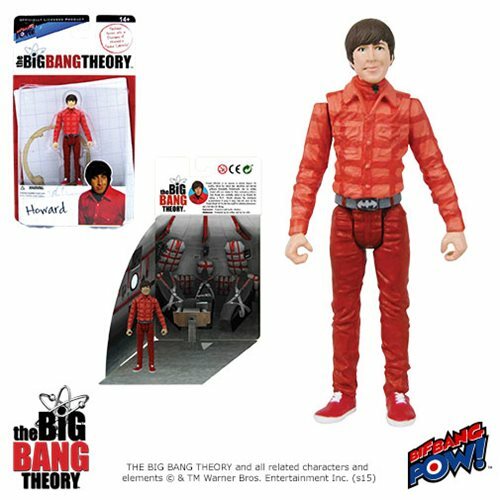 When it comes to ultra-cool action figures based on the sitcom The Big Bang Theory, The Big Bang Theory Howard 3 3/4-Inch Series 1 Action Figure from Bif Bang Pow! is just what you need! Howard Wolowitz stands about 3 3/4-inches tall, is fashioned of plastic, and features multiple points of articulation. Ages 14 and up. But wait, there's more! Howard comes in totally unique full-color packaging that turns into a diorama that includes pop-up features. Pose your figure to recreate popular scenes from the show! Howard Wolowitz is an engineer in applied physics. He recently retired his “ladies man” aspirations and married girlfriend Bernadette Rostenkowski, who he initially bonded with over disdain for their overbearing mothers. Even though he’s constantly picked on by Sheldon for lacking a Ph.D., Howard achieved the prestigious accomplishment of going to space (and will never let his friends forget it). He also has a gift for celebrity impressions, and a horrible nut allergy. Superpowers: Expansive belt buckle collection. Weaknesses: Dominated by his mother and now his wife.